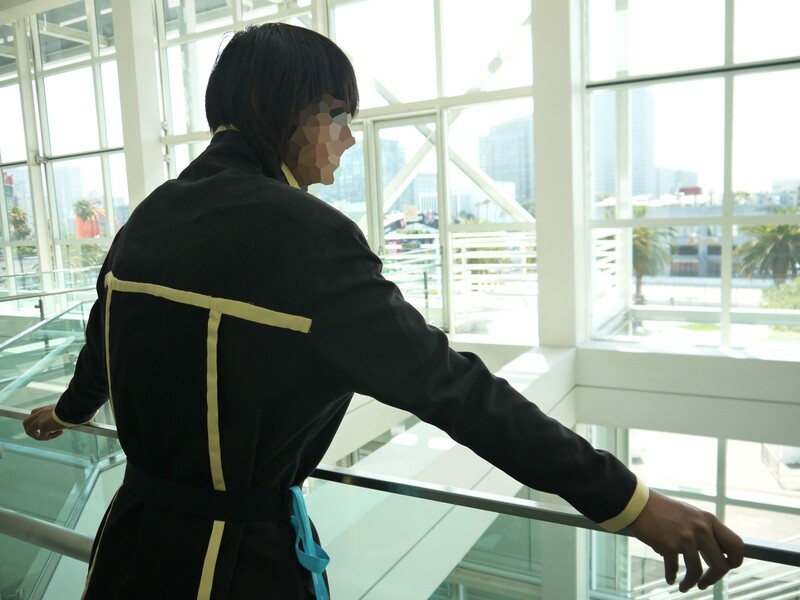 In previous years, I’ve gone to Anime Expo mostly as Lelouch Vi Britannia (from Code Geass, for those unfamiliar). 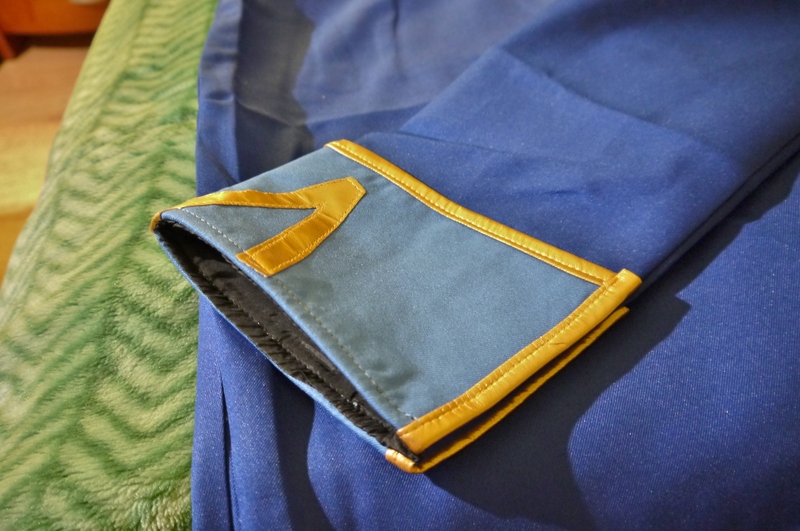 I’ve worn the Ashford school uniform for two years in a row at the convention, and it was actually hand-made by my grandmother, a skilled seamstress in the family. With Code Geass being one of my favorite animes and Lelouch being a hallmark character for me (I have the hair and lankiness, so why not?) I decided to portray him again this year, but with a different outfit. 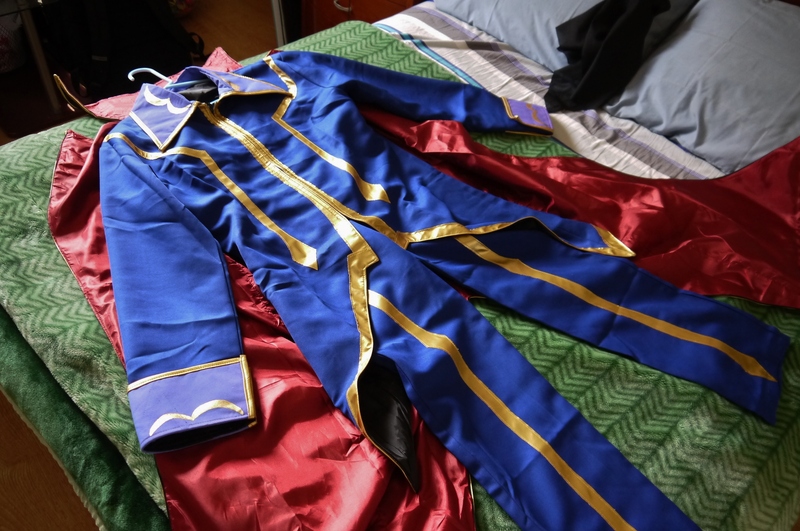 I’ve been planning on going to AX as Zero for quite some time, though never got around to buying the costume until now. 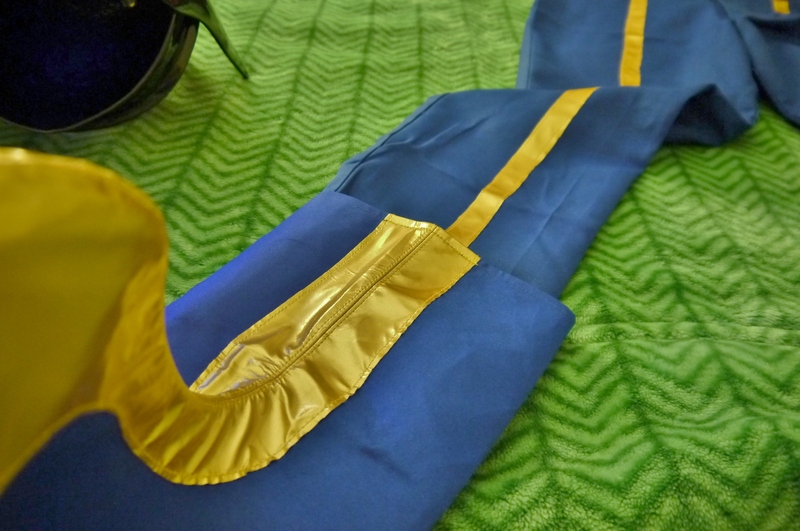 When I first received the costume, it was less than perfect, which is what I expected and desired. This is what was promised to me by the seller. 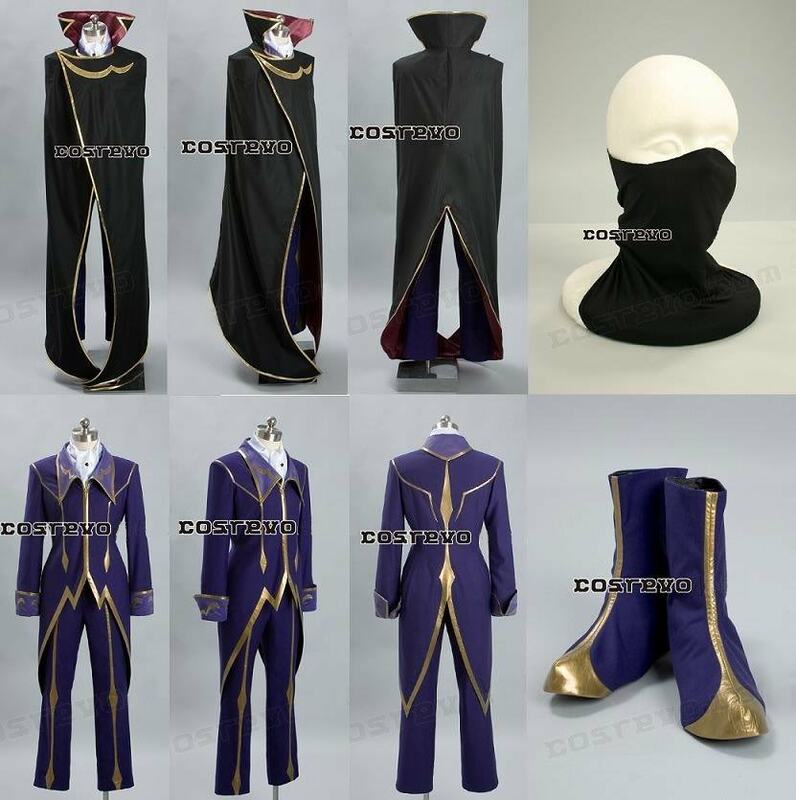 It’s actually a popular stock image of the costume, but I expected that the seller would make it just as it was shown. He used this image for the auction, so it was only fair to assume that it was what I would be getting. Unfortunately, what I got was complete bull. 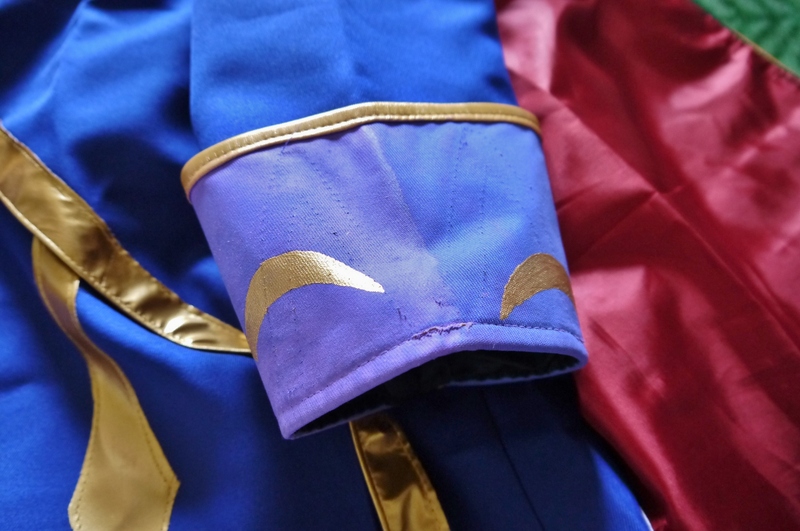 For starters, the Zero costume itself is a light blue-ish purple, with a different shade of purple for the collar and sleeve areas. The outfit I received sported a true blue for the majority of it, and a baby blue for the collar and sleeves. Ridiculous. The blue for the majority of the outfit is forgivable, but the baby blue highlights warrants the death penalty. 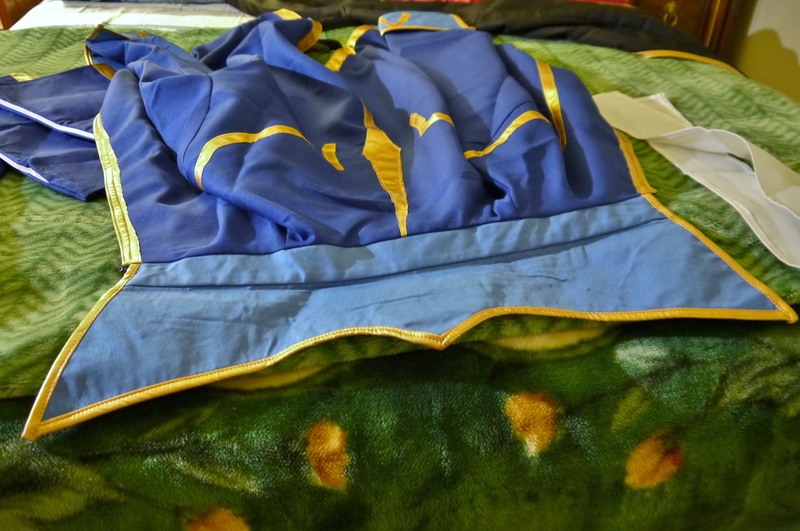 Another issue that bugged me to no end was also in the sleeves and collar. 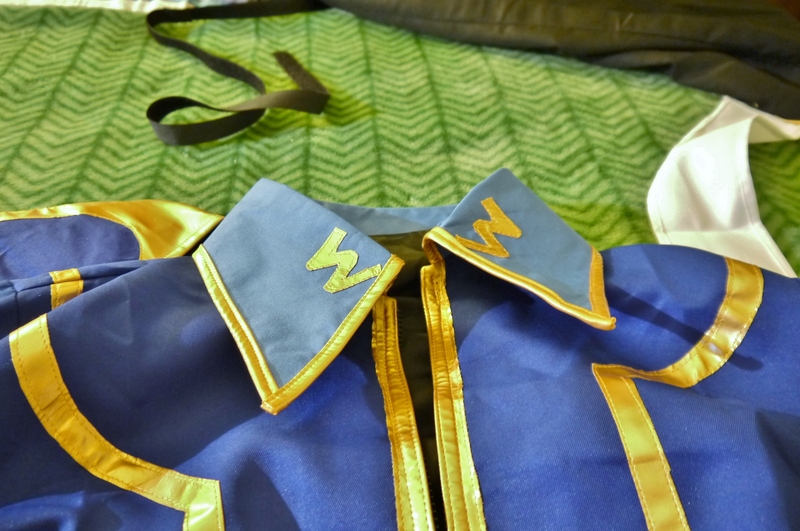 For some reason, the seller decided the costume sported “M”s and “W”s on them. Seriously, really? It doesn’t look remotely like what was shown in the picture, and the design of it is ridiculous…two straps are meant to hold it to my feet? Really? 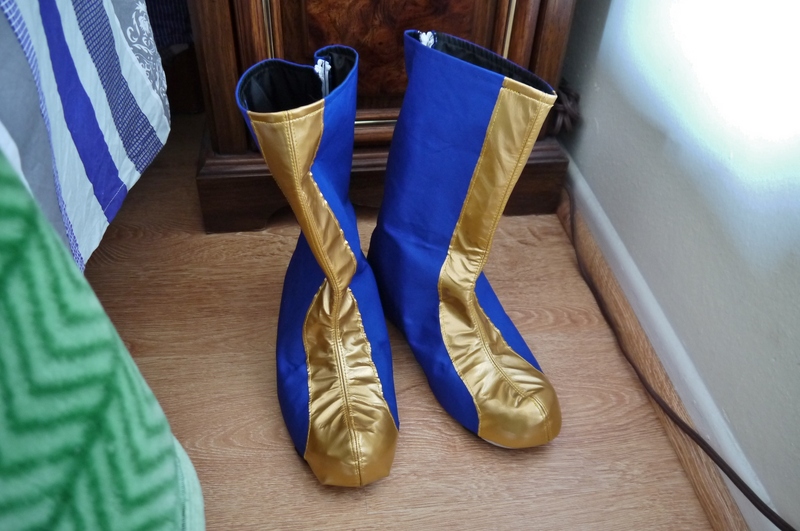 To top that off, the design of the shoe covers are horrid in that the gold strips are too fat and don’t match the ones on the pants. 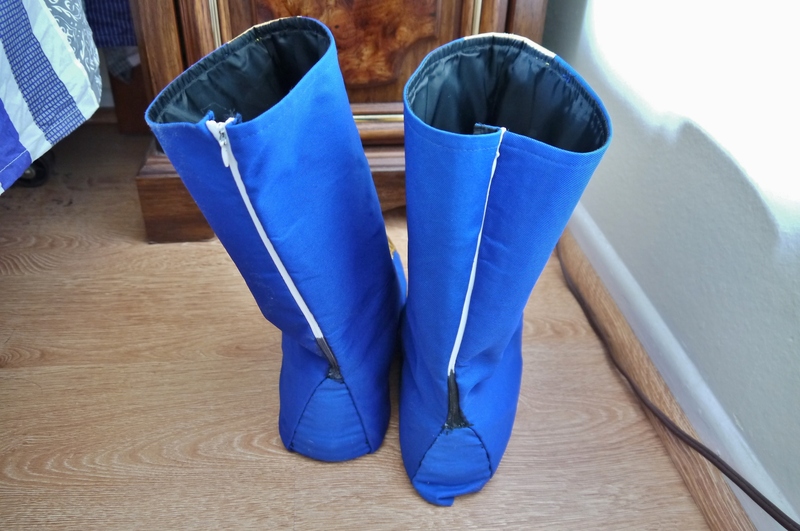 The covers themselves, when put over my feet, look like giant Ugg boots. I looked like a ridiculous clown with those things on. 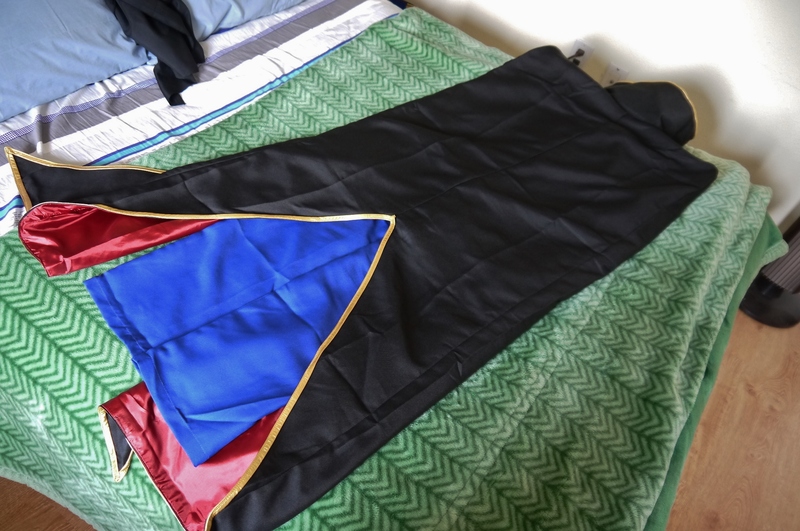 In addition to the main robes, you get the white neck wrap and the black cloak. No mask, gloves, or face cover included, though I got those covered. 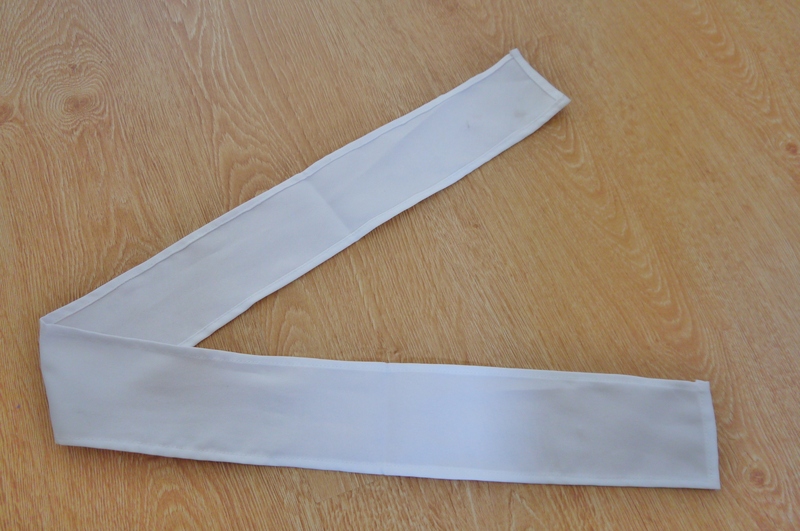 The original neck wrap was a thin long piece of white fabric with a black button sown on. Talk about skimpy. I reported all these problems to the seller and demanded compensation, as I paid a good $130~ for this thing. He responded with ridiculous arguments like different LCD monitors showing different colors and therefore invalidating my complaint on the colors. In addition, he insisted that the picture shown above was really his own photoshoot, despite the fact that the exact same image is used by countless other sellers. Apparently the boots were tilted and shown in the best possible angle, but no insane camera angle will make up for the ridiculous discrepancy. I went ahead and made my own adjustments. 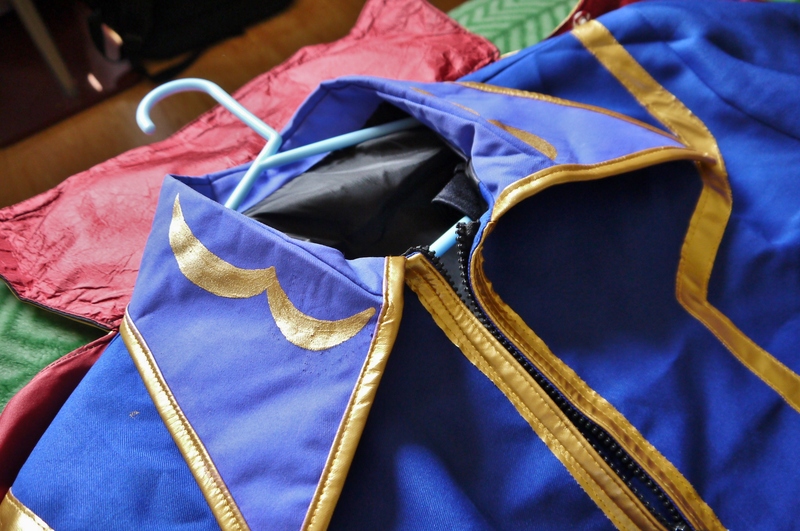 The true blue on most of the main garment can’t be changed, though I don’t mind it as much. 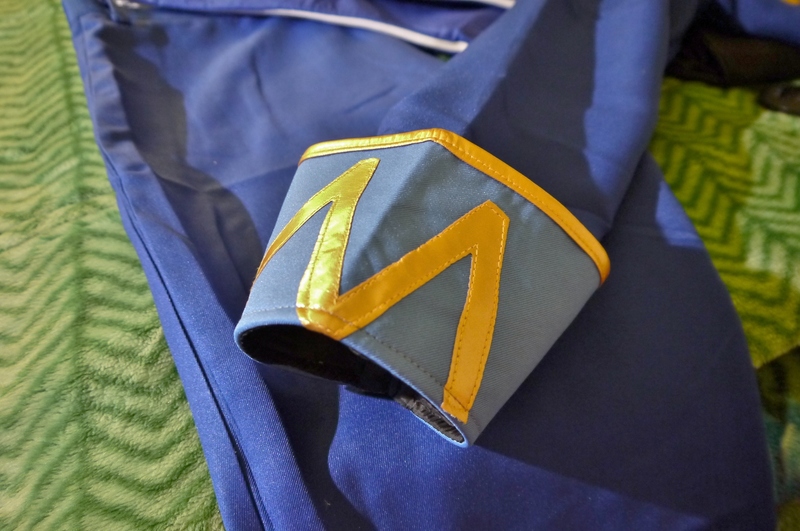 Something had to be done about the stupid collar and sleeve cuffs though. I went ahead and took off the “M”s and “W”s. They were sown on surprisingly well, but then again the entire thing is actually put together pretty well, even if it isn’t exactly accurate. Upon ripping those out, I proceeded to break out the lavender acrylic paint and used it on the fabric. At first, the paint didn’t seem to go very well on the collar, but when it dried, it was absolutely beautiful. A nice even lavender was the result, and a huge difference from the previous baby blue. A drawback of the acrylic paint was the fact that it smelled something awful, so I initially made a visit to JoAnn’s to pick up some purple fabric paint. Unfortunately though, that fabric paint didn’t quite work out so well after one coat, so I tried to wipe it all off and away before reapplying the acrylic over it. I had only applied it to one section of a sleeve, but when the acrylic dried, it didn’t yield a particularly satisfying result. One sleeve ended up being two shades of the lavender, thanks to the initial coat of failed fabric paint that didn’t come out all the way. Had to cut my losses. 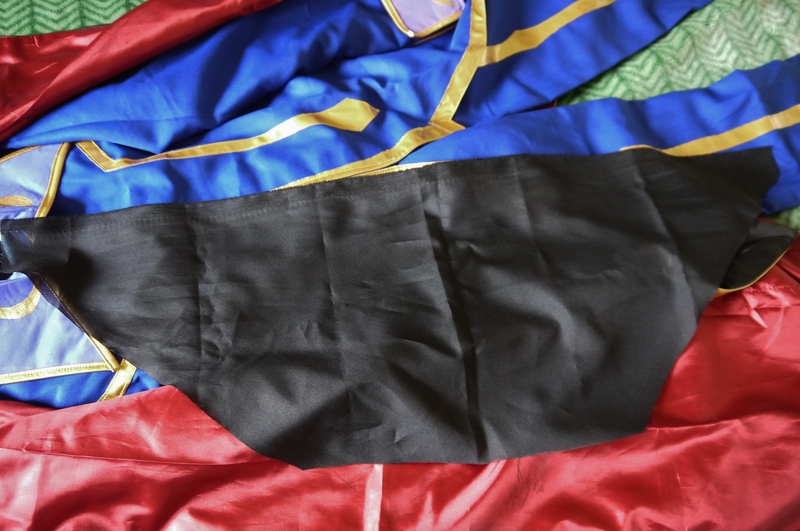 My comrade apparently has a large stock of fabric at his house, so I asked for a piece of black to use as the partial face veil and he delivered quite well. It’s nice and thin and ties perfectly around. 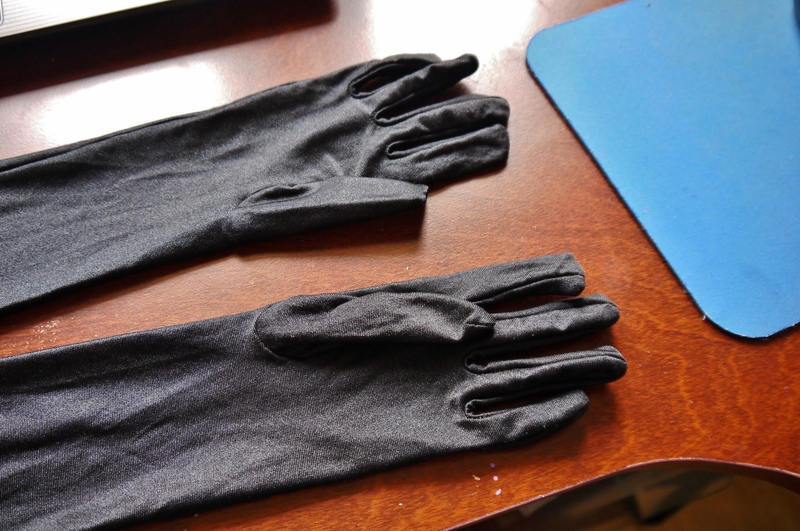 Went ahead and bought some cheap thin and stretchy bridal gloves, the long elbow kind that are used in weddings and the like. I love these things, they fit so well and slim. Always had a hard time finding appropriate pair of gloves since many of them are too thick or bulky, but these are nice and form-fitting. 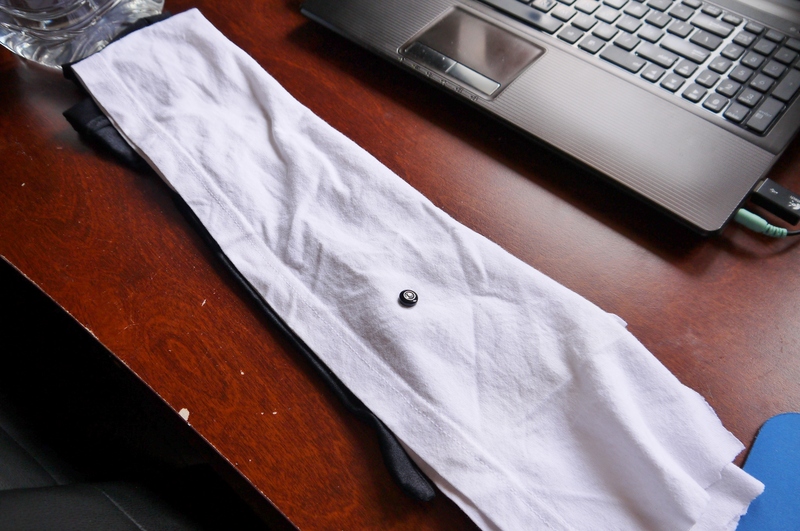 As I mentioned above, I wasn’t quite satisfied with the one piece of white fabric they gave for the neck wrap, so I cut up one of my plain white t-shirts to use instead. Took the button off the original wrap and glued it onto this one. 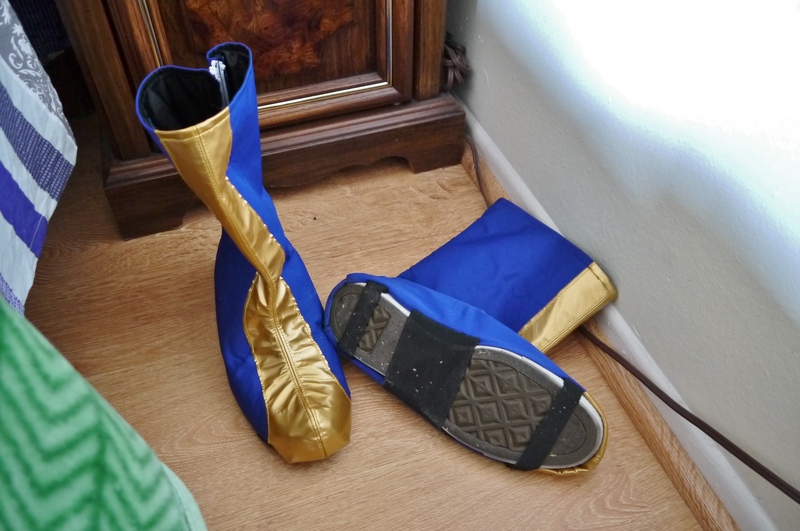 One of the biggest parts that needed an overhaul were the stupid shoe covers…I went ahead and took the request to my seamstress grandmother, who agreed it was possible to fix it up and make them look presentable. And she did. She modified them to fit a pair of my Converse shoes exactly, and added a thicker strap in the middle while moving the smaller ones to the front and back of the shoes. 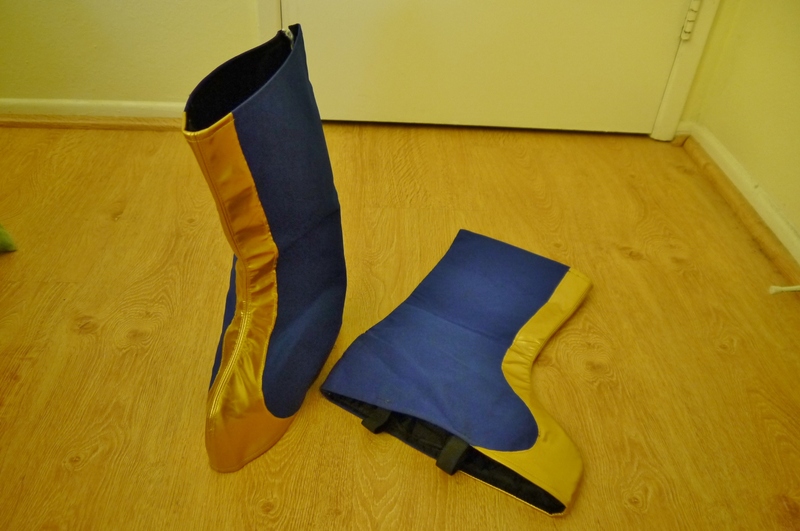 At the same time she also folded in the bottoms and sowed them together, making the boots look much more presentable and less…bulky and ugly. The back also had to be expanded to fit my shoe, but the quality of work is excellent. 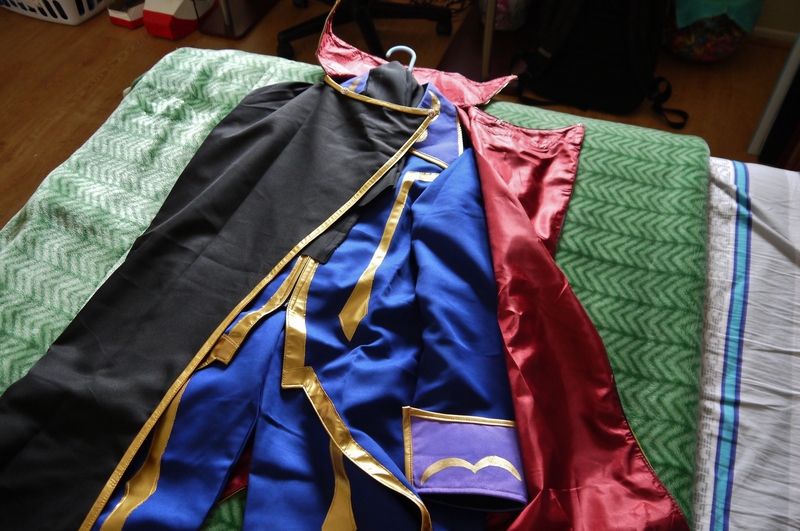 You won’t be seeing the back of my boots much anyway with the cloak so I was satisfied. 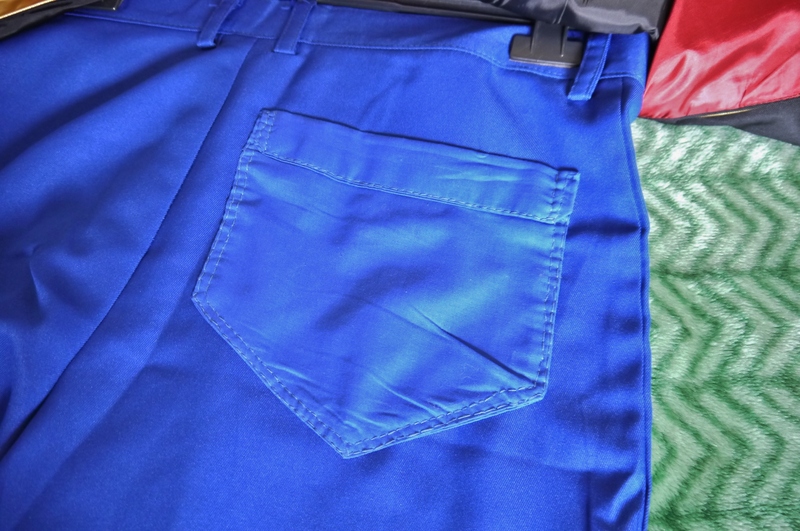 My grandmother was also kind enough to add a back pocket onto the pants for me, as they originally sported no pockets at all. Primary reason was to allow me to carry my wallet on me during the convention, as the buying of tons of anime merch shall be done. But of course, what would Zero be without the mask? I originally planned to just go without the mask, as I figured the outfit alone would be enough, but then upon some further consideration, I decided to just go all the way and take the $250 plunge that was the mask. 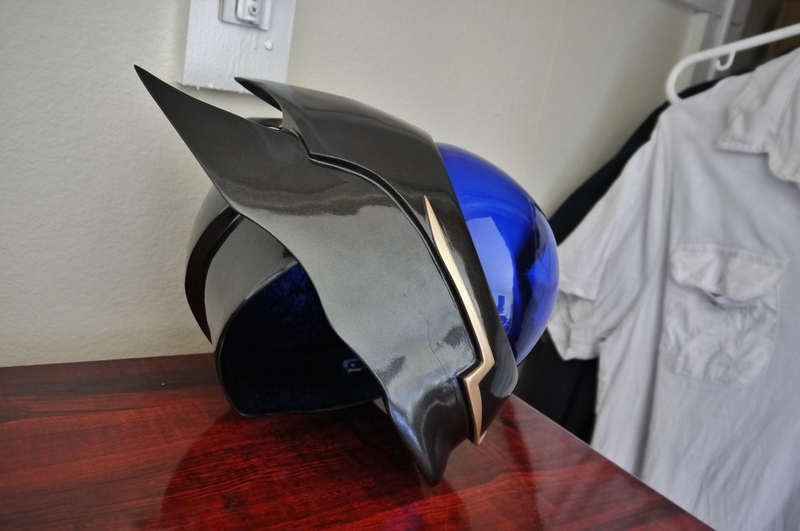 While very expensive, I do think the helmet was worth the money; it’s exceptionally well made, at least cosmetically. Just looking at it in third person, it looks just like its anime counterpart. 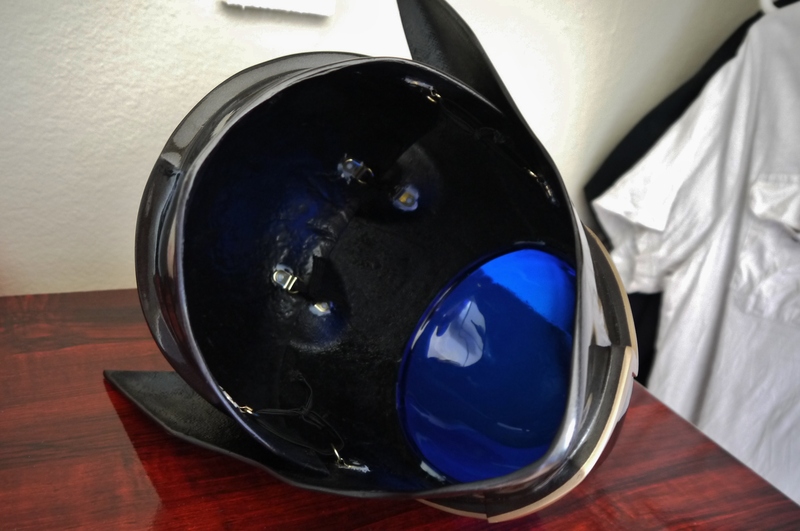 Unfortunately though, the clear blue visor piece itself was a little lacking, as it’s a bit messed up around the outer areas. You can only really see clearly out of it from the middle of the orb. 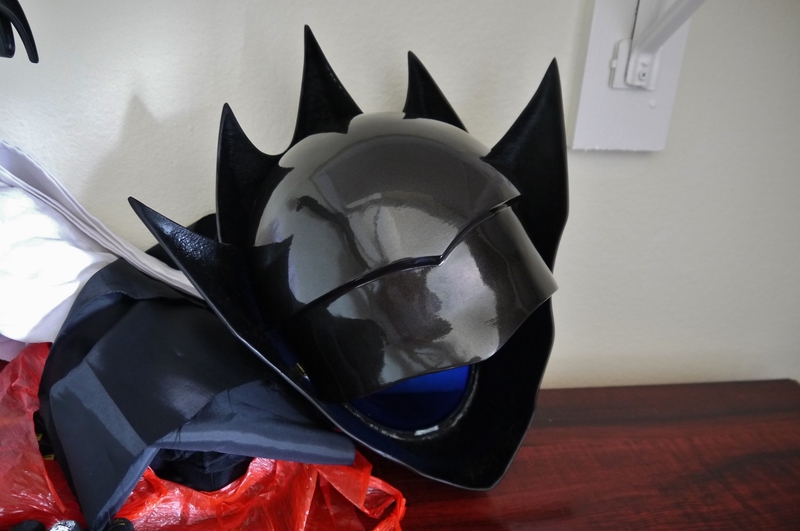 The mask itself is held together as two halves, with stretchy nylon straps holding it together. They can be adjusted according to head size. Upon first receiving and putting the mask on for the first time, the straps were still pretty tight and it was hard to get on, to say the least. Upon finally shoving my head into it, I had a mini-panic attack. It was like a vice grip on my skull, and I got a little claustrophobic with such a tight bucket on my head. 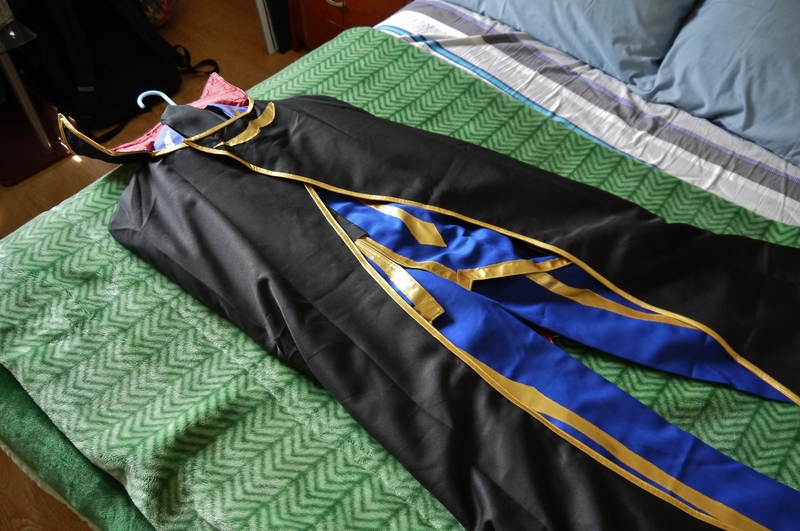 Fortunately though, after some adjusting and getting used to it, I can take it off and on comfortably now. 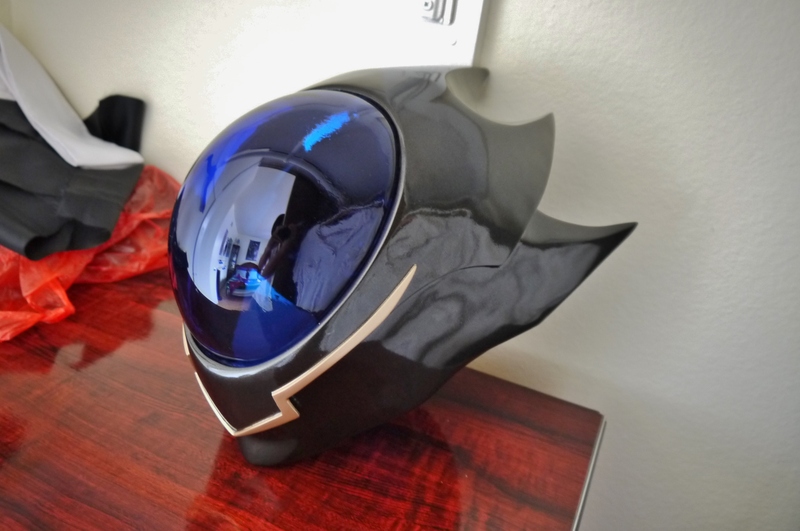 Can’t wear it too long due to breathing issues and fogging up the clear blue orb though, so that throws out my original plans of having it on the entire convention. Might just carry it in one arm and put it on for pictures and the like. 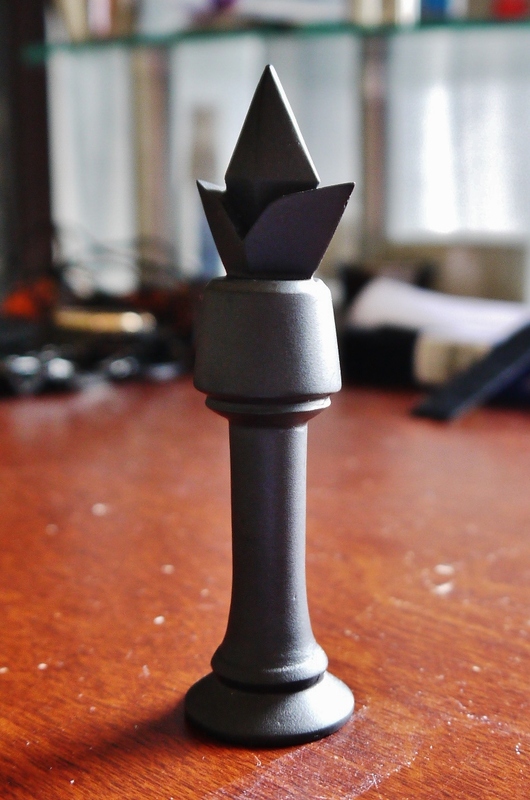 The mask seller also included a little Black King chess piece used by Lelouch throughout the Code Geass anime. While not initially expected, it’s a nice touch to the costume and character. Overall pretty satisfied with how the costume turned out, and it’s suped up and ready for the convention tomorrow. It’s sure as heck gonna be hot in this thing, but hey at the very least it looks cosmetically presentable.